Today I was rugged up with winter coat, gloves and swaddled in a scarf battling against the gale and wintry sleet. It was not a day I wanted to venture off the veranda let alone have to hack into town. As well as work appointments I had a coffee date with a new acquaintance I didn’t want to miss. Much to my surprise the closer I got to town the brighter things became and by the time I parked up and started walking to my first appointment I was bitterly regretting the boots, thick tights, double layers and winter coat. For in Wellington it was breezy and bright. Not bright enough to abandon all my winter gear but enough to make me stand out from the crowds as someone from colder climes. After a day of toing and froing to appointments it was a relief to sit down for a breather. To catch up with a person I’ve only met once before, a friend of a friend. Moving to a new country and becoming self employed means that meeting new people is an important part of making your way in your new world. I’ve come to enjoy blind dating for friends and clients as the word of mouth referrals tend to be sound and I find myself meeting more and people who I have things in common. Today was one of those days – not only have I found a new prospective collaborator for work but she’s also an avid photographer. I can see us becoming the ultimate two of a kind. I made the mistake of just wearing a jumper to do he school pick up, despite the glorious blue skies it was flippin freezing!! bassets make good watch dogs, not the protective kind, the watching kind, they love to find a good spot to watch the day go by. Like a human with a good book, they just seem to take it all in. 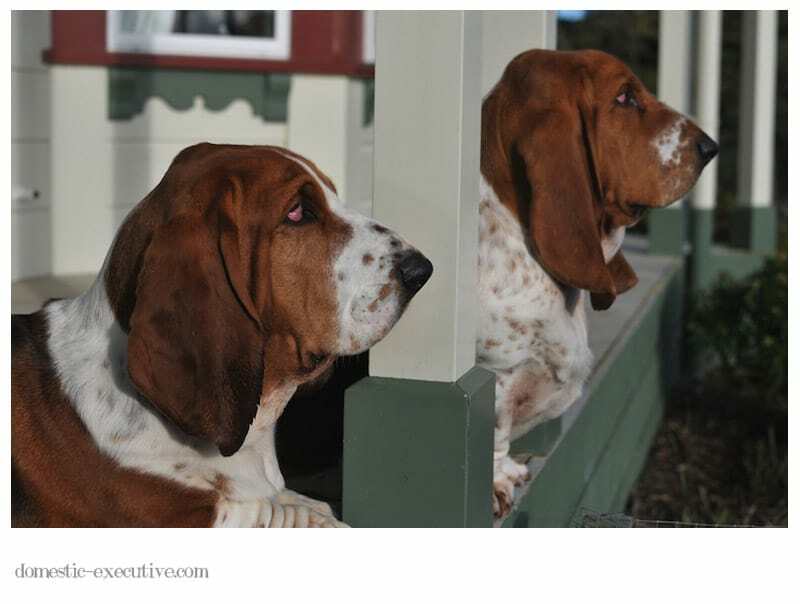 Your boys are adorable here, watching country life takes a leisurely strol right on by.